The Omen X Emperium is a staggeringly huge gaming monitor, but it’s not quite a TV replacement. Gaming at a desk has always had a couple of big advantages over gaming on a couch. Two examples? High refresh rates and G-Sync. But now, the living room has caught up. 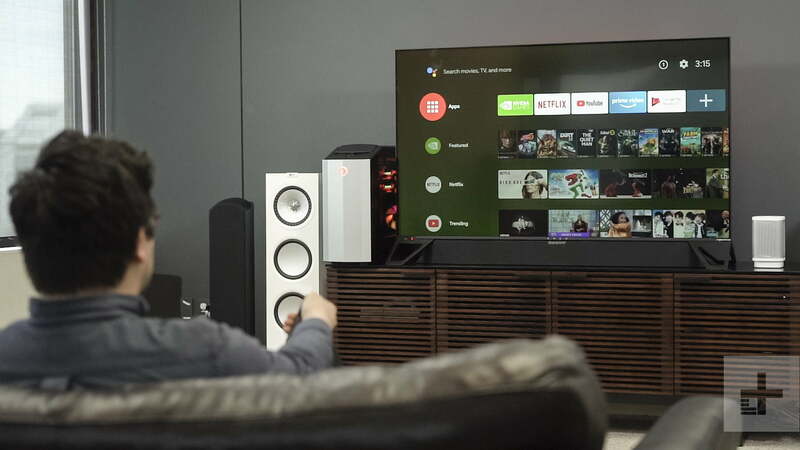 The 65-inch Omen X Emperium might not call itself a television, but with its massive screen real estate and wide stance, this thing is made for the living room. It challenges the very definition of a gaming monitor, as does its $5,000 price tag. So, do the unique gaming features make for the ultimate PC gaming experience, or are you better off with a standard television? 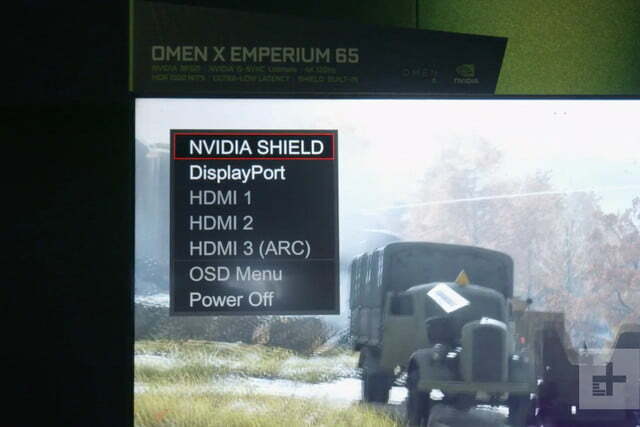 The Omen X Emperium is a TV. No, it doesn’t have a tuner, but it is meant to sit in a living room in place of a television. For all intents and purposes, it’s a 65-inch television. Which is why, I assume, HP didn’t do anything crazy with its design. 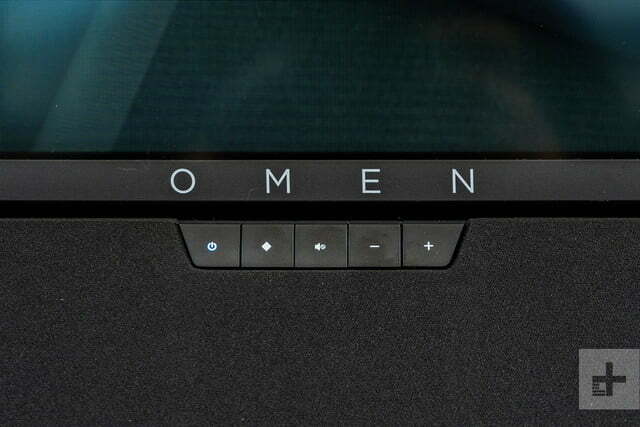 Outside of the name, you might not even know it wasn’t from LG or Samsung unless you notice the Omen logo at the base of the screen. 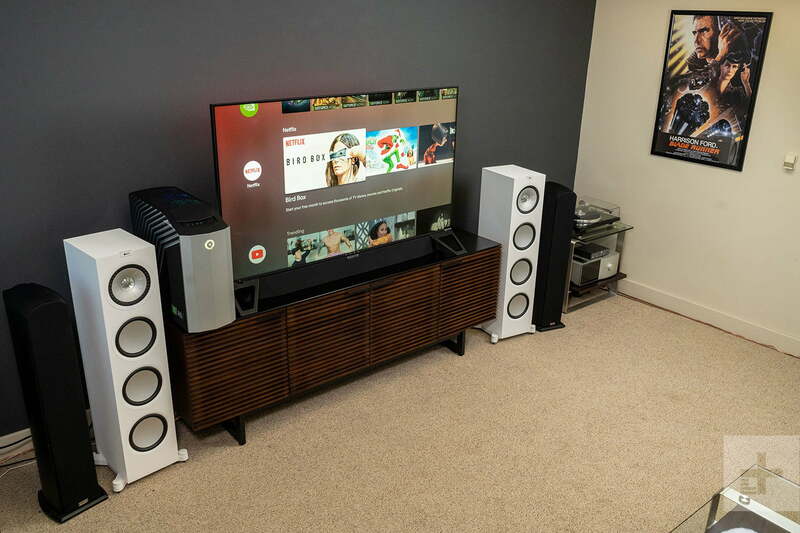 The set has slim bezels, industrial metal mounts, and even comes with a fairly nondescript black soundbar. 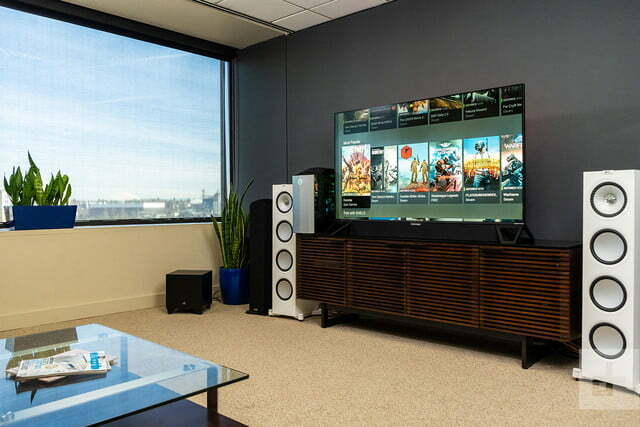 It’s impressive for HP’s first foray into living room-sized screens. From the front, at least. Turn it around and the Emperium has more explicitly gaming-oriented chrome, including an Omen logo and some lights. Because most people will want their TV up against a wall, most of that will go unseen. You will notice, however, the LED strip across the back cabinet that adds splash of red glow on your wall. It’s a subtle touch that provides a nice distinction from competitors. 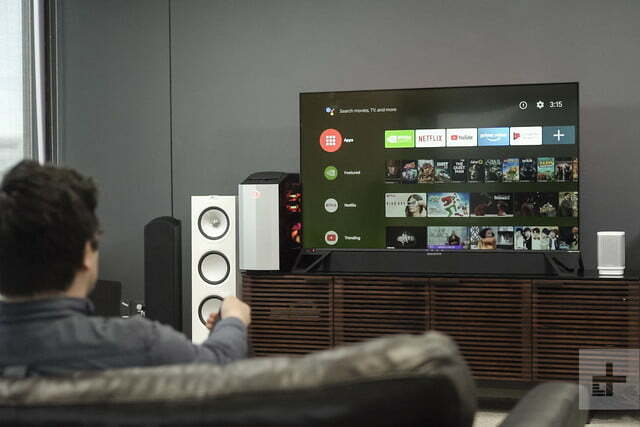 The design is completed by a slick, black soundbar that comes bundled in the box. That’s not to say the Emperium is a dainty, ultra-thin display. Befitting of the name, the Emperium is hefty. It’s heavy (as is the box) and super-sturdy. You’ve got access to two USB-A ports, two HDMI ports, an ethernet jack, and DisplayPort. It also uses legs at each end of the display instead of a single stand in the middle. That makes it feel solid, but you’ll need a huge entertainment stand to get it up off the ground. 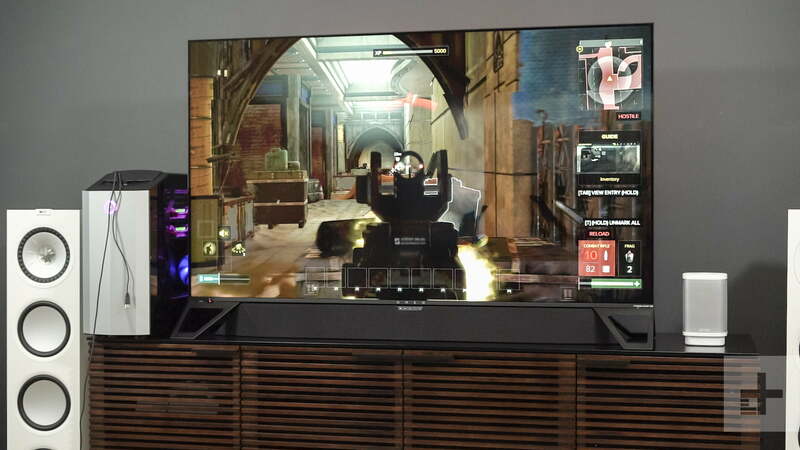 Upcoming large-screen gaming monitors like the Asus ROG Swift PG65 or the Alienware 55-inch OLED gaming monitor include more traditional stands. The Emperium does have VESA mount. Yup, you can mount this massive screen up on a wall if your heart so desires. The subdued look is important, though. The Omen X Emperium may have gaming chops at the forefront of its marketing, but if you’re putting this in your living room, you don’t want it to stand out while watching a movie using the included Nvidia Shield interface. Nvidia previously sold the set top box as a separate unit, but it’s now built into the television in the same way Roku TV might be. That gives the Emperium important smart TV capabilities. The Omen X Emperium features a wide selection of ports, including the ones you’d expect and some interesting PC-specific options. On the right side, you’ve got access to two USB-A ports, while on the left you have your two HDMI ports, an ethernet jack, and DisplayPort. The DisplayPort is what allows for the highest refresh rates – up to 120Hz (overclockable to 144Hz). The power switch, as well as the power plug, are both located on the back, in a rather hard-to-reach spot. It can be difficult to set the display up. Once you do, though, you can forget about it – this is basically a television, after all. The Emperium’s remote and controls could be better. A single joystick is located on the bottom right side of the back of the unit, giving you access to different color modes and settings. We must talk about the remote controller, though. It has some issues. 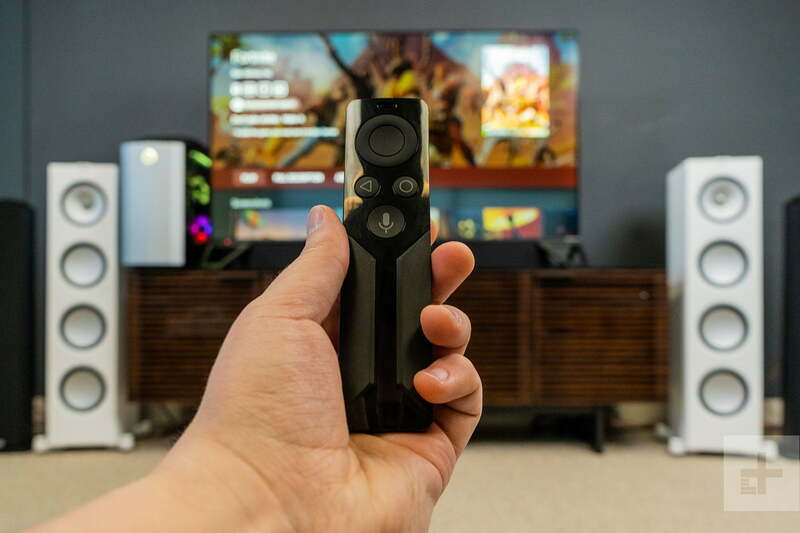 It’s the same remote you’ll find packaged with an Nvidia Shield TV set top box, and for that, it works fine. However, its features are limited for a remote that’s supposed to control the entire display. It has just a single navigation wheel, a back button, a home button, and a Google Assistant button. It doesn’t seem sure if it wants to be a television or a gaming monitor. The center of the navigation acts as your power button when turning it on, but there’s no dedicated button to turn it off. If you’re using the Shield TV, you’ll have to navigate up to the top and over to Settings, where you can then click on Sleep. The screen will, of course, go to sleep on its own, but a dedicated button on the remote would have been nice. It’s the same problem when trying to access things like switching inputs. Once you’re in Shield TV mode, the only way to switch over to your PC is to head back up to settings and select On Screen Display, which brings up the standard screen settings. It’s something that could have been avoided by voice command, but voice commands don’t work for most TV settings. Then there’s the volume slider. Instead of a pair of buttons or a rocker, the Shield TV remote uses a touch-sensitive slider across the bottom half of the front of the remote. It feels slow at first, then jumps between volume levels way too quickly. You can easily find yourself turning the volume up from 25 to 75 without intending to, waking up your entire neighborhood as a result. 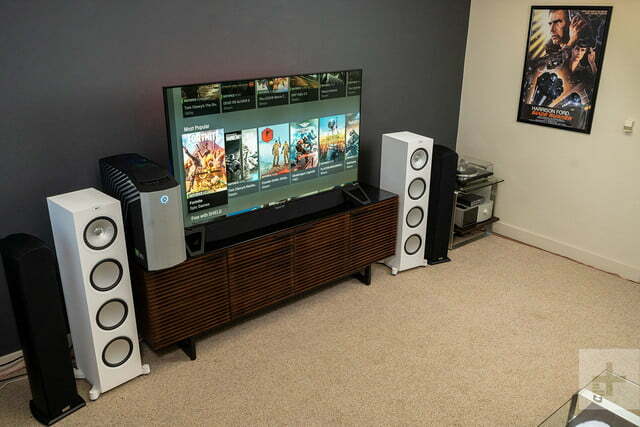 As mentioned, the soundbar is included in the box. It’s a nice addition given the price of the package, but it’s nothing special. Bass doesn’t have a strong presence, and it’s delivered through a single 3.5mm jack. 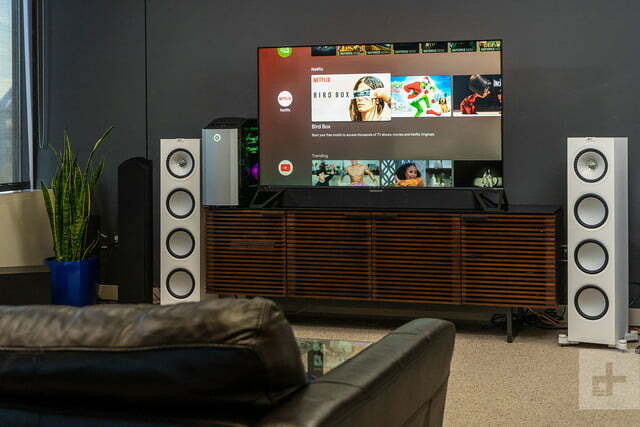 If you’re spending this much on a television, chances are you’ll want some surround sound to complement the visuals. The controls are where the Emperium’s seams show. Unfortunately, using this as the central hub of your entertainment system just doesn’t feel like a cohesive or fluid experience. Its not sure if it wants to be a television or a gaming monitor. At $5,000, it’s no surprise that the gaming experience on the Emperium is excellent. It’s a 4K, 3,840 x 2,160 resolution screen, complete with support for a 120Hz refresh rate (144Hz if you overclock, and why wouldn’t you? ), G-Sync, and HDR1000. These are all the specifications you want to see in a gaming monitor — and some are a first for aliving room screen. G-Sync is perhaps the most notable. 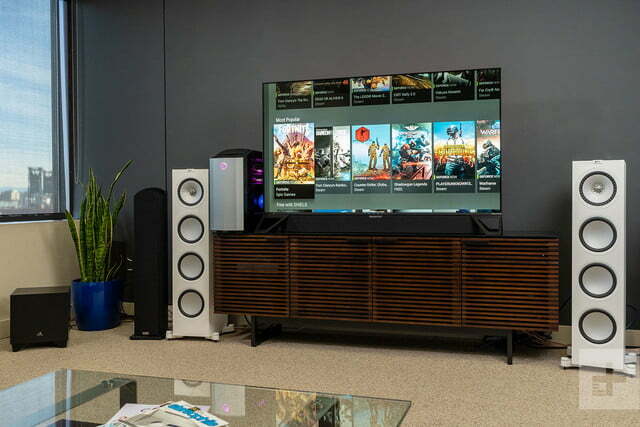 Nvidia keeps a tight wrap on its patented adaptive sync tech — and for good reason. It’s the best in the business. Seeing a smooth, tear-free experience on the big screen is impressive. So long as you stick to the DisplayPort input, a fast-paced game like Battlefield V or Fortnite looks better than ever. It feels lag-free and smooth in a way that only a true gaming monitor can offer. But things in the TV world are changing. Samsung will soon offer HDMI 2.1, which brings variable refresh rate to standard televisions. FreeSync, the popular alternative to G-Sync, is now also being offered on these platforms for AMD systems. The results we saw from our colorimeter were equally impressive. We measured the Emperium with our standard monitor testing and saw a record-high contrast ratio and brightness. 592 nits is enough to overpower any reflections, even in a well-lit room. Meanwhile, we saw impressive black levels across the board, which makes both games and movies all the more immersive. You won’t be editing photos on it, but the Emperium even has decent color gamut and color accuracy. It can’t be only judged as a monitor though. Sitting straight-on, the contrast looks great and the colors are vivid. When you move off axis, things take a turn for the worse. It’s a problem with nearly all LCD screens, but this one is even more noticeable than normal. Bright, vivid colors look washed out and blacks lose their sense of depth. If you’ll be playing games solo, it’s not a problem. But if you’re playing local multiplayer or watching movies with a large group, your seat in the room will give a less than positive viewing experience. We also noticed vertical banding, as well as vignetting and splotchy areas along the edges. None of it is atrocious, but the processing and the quality of backlighting can’t compete with the best TVs from Samsung or LG. That’s a problem because the Emperium is expensive. You could almost buy two top-tier LG OLED televisions for the same price. 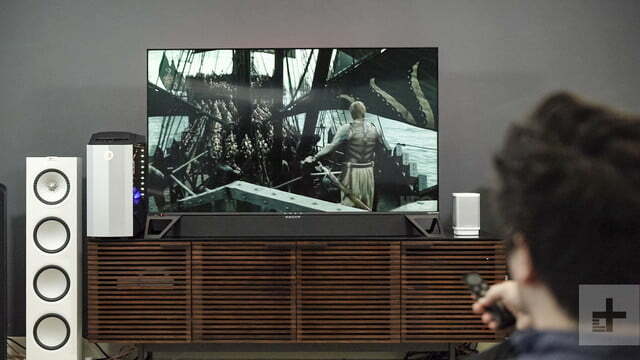 Though it’s meant to be used with a PC, the Emperium is a capable smart TV. Nvidia’s Shield TV is powered by Android TV, so it comes with a pleasant interface and direct tie-ins to YouTube, Netflix, and Google Play Movies. It even has Chromecast built-in, meaning you cast the screen of your laptop or phone to it. As noted on the remote, it also has support for Google Assistant, tied right into the remote. It’s one of our favorite voice assistants, and having it in the living room is always an added convenience. Unless you own two PCs or like carrying your desktop from room to room, it just doesn’t make much sense. Specific to the Shield TV, as well, is Nvidia’s game-streaming service, GeForce Now. It’s a bit of an odd thing to have on a television meant for connecting to a powerful PC, but hey, it does put the service in the hands of more people. You could can also use GameStream, which allows you to stream a game from another PC in your network to this display, without having to lug your PC around and connect it directly. It makes a lot of sense as a feature on for the Nvidia Shield TV, but again, doesn’t make much sense on the Emperium. That’s because both GeForce Now and GameStream fail to make full use of the display’s high refresh rate and solid image quality. Streaming games to the Emperium is convenient, but if you’re going to do that, you may as well use a ‘normal’ television. That shines a spotlight on the real issue with the Emperium — and the very idea of the living room PC. Most people use their gaming rigs for things other than gaming once and awhile. Writing a term paper, editing an Excel document, or even browsing the web just aren’t activities suited for the living room. Unless you own two PCs or are fine carrying your desktop from room to room, it just doesn’t make a lot of sense. But for those who swear by letting their PC be the center of their living room, features like GeForce Now or game-stream are nice additions. The Omen X Emperium is the first of its kind. It’s a trailblazer for sure, but that doesn’t mean it’s quite ready for prime time. As of now, for a very specific person, the Omen X Emperium might make some sense. If you plan to leave your powerful gaming rig in your living room and use it pretty much exclusively for games, the Omen X Emperium is one of the best gaming experiences you can have. So long as you’ve got a spare $5,000. 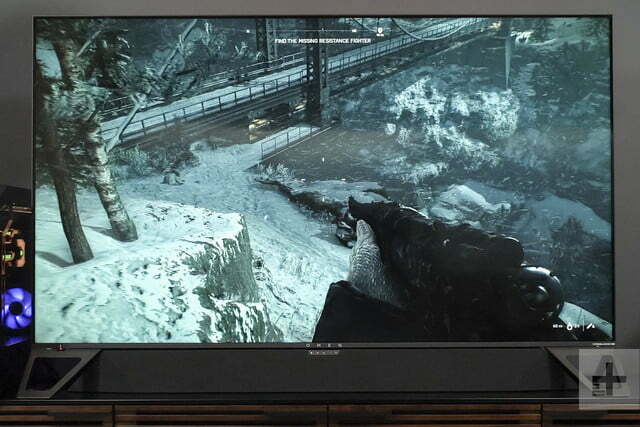 For most people, though, television-sized screens and gaming PCs still don’t go together. Things like Windows 10, mice, and keyboards are all office tools, meant for a desk. Even just figuring out how HP or Nvidia might imagine someone use the Emperium required some imagination. Until there are more obvious advantages over a traditional television, it’s a hard option to recommend for the average gamer. There are plenty of fantastic gaming monitor out there, all of which have 4K, G-Sync, and 144Hz. 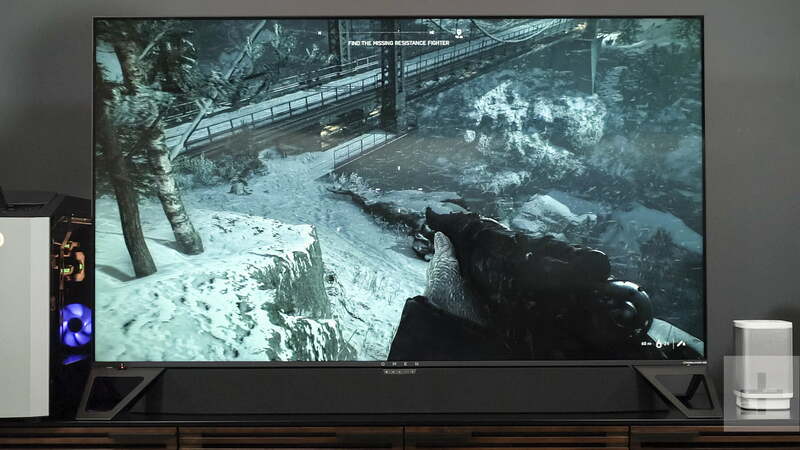 Meanwhile, there are extra-large gaming monitors, as large as 49 inches, that are still designed for the desk. The best is the Samsung CHG90. 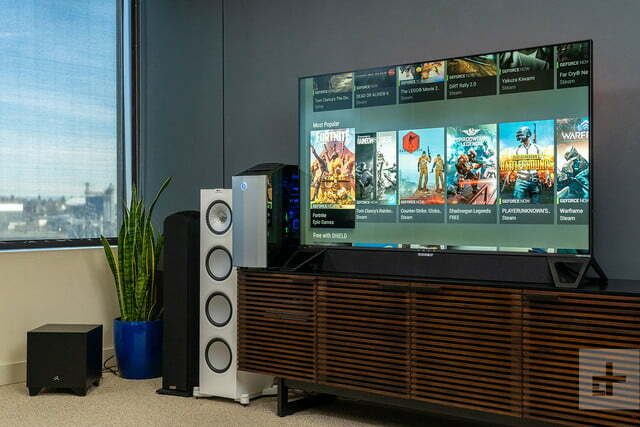 If you’re looking to fill your living room, some of the best television options for gaming include the Samsung QLEDs, which will soon support variable refresh rate and AMD’s FreeSync adaptive sync. It’s bound to give you significantly better image quality at a lower price. There are also a couple more displays on their way more in the vein of the Emperium. 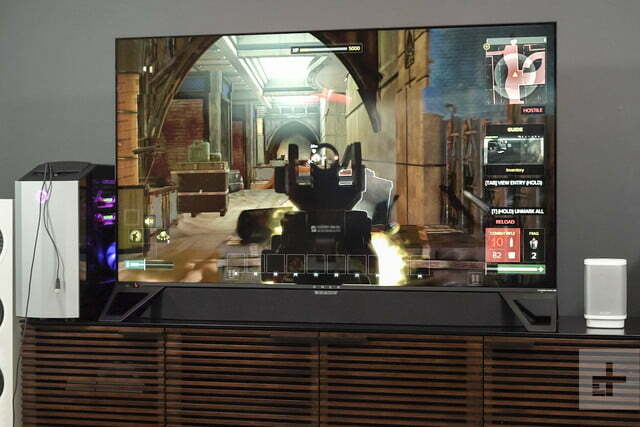 Asus has a ROG-branded 65-inch G-Sync gaming monitor, and Alienware has its 55-inch OLED option. We haven’t tested either though, and both are due out later in 2019. No, probably not. A high-end television will give you better picture quality, and some even provide variable refresh rate for smoother gameplay.